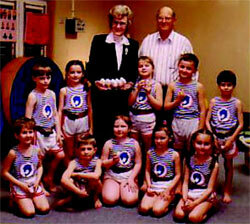 The Gym Class of Christian Pre-School performed and presented gift to Mary S. Relfe and Bernard Stewart. 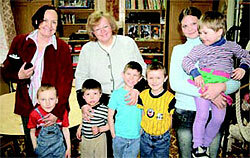 League of Prayer established Russia's first Christian Pre-School. In addition to learning about Jesus, earth sciences, green house skills, swimming, ballet and gymnastics were taught. More recently, our efforts have concentrated on Children's Homes, Orphanages, City Shelter, City Sunday School and sponsorship of students forced from Orphanages prior to High School graduation due to overcrowding. While in these institutions League of Prayer assisted with food, clothes, medicines, Children's Bibles, school supplies, recreational equipment, sometime surgery, rehab and Certified Bible Teachers/Ministers who taught them about the Lord. From time to time updates will be given on each of the institutions League of Prayer has supported many years. Valentina & Boris Petlin, Directors of League of Prayer - Russia, very principled people, sacrificing retirement to assist the poor children of Russia. Pray for these dear friends. "Boris & Valentina took us to an additional facility, a Children's Sanitarium, of which they said: 'Conditions are the worst we've ever seen!' They pleaded that we begin support of it. Upon visiting it, we agreed. Mary, I could not bring myself to taking one picture of these children. They were in such squalor that showing pictures of them seemed like exploitation." These children - wards of the State - have for a few years now been forced out of Orphanages on the streets with all belongings in a paper bag - until League of Prayer intervened. (Streets mean prostitution, drug addiction and in two cases, death). Our supporters, thus far, have sponsored all dismissed students and provided for their needs until they graduate from High School, and in some instances, college and university. Each sponsor/student corresponds with each other by letters monthly. These sponsors (via exchanged letters) almost reach the point of "foster parents." Rev. 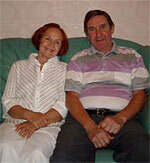 Brian & Lilian Taylor returned in June 2006 from our 32nd mission trip to Russia. Brian's e-mail from Russia: "My, how things have changed... the rich have gotten richer, but the poor have gotten poorer, especially the children. Family break-ups and alcoholism are causing more children to be placed in Orphanages...The Bible Teachers do a great job in making the lessons exciting for the students...They all raise their hands or stand hoping to be called on to answer the questions. About 6 children opened one of the Classes in prayer...Demand on Children's Homes is the cause for dismissing children upon completing the 9th grade instead of allowing them to finish High School..."
Few of the Sanatorium staff. Center lady is Head Physician, man on her right is a doctor who works under her. R) League of Prayer's ordained minister who teaches the Bible to the children there; others are employees. Yes, it is May-day for Russia's poor children! We no longer have Millions for Missions! Overseeing a global charity, writing Newsletters, praying over and responding to multiple needs of supporters leave me no time to write books. This "Dismissal Program" places a greater financial burden on League of Prayer, USA, which supports League of Prayer - Russia 100%. Most donations received now are designated Student Sponsorship. Little is donated for general expenses as food, medicines, clothes, Bibles for Orphanages, or salaries for our Russian staff of at least 10, or office, auto and general expenses. The Sanitorium accepts up to 500 children a year, ages 3-12, either orphans or from broken homes, all pre-tubercular with weak immune systems. The Administration e- mailed a list of dire needs for these children and prevailed on us to please respond with assistance. Sanatorium, General Expenses for Children's work, New Truck and funds for Children's Color Illustrated Bibles. Though the world is my parish, and League of Prayer is, and has been, involved in substantial mission works over the world, deep in my heart, I believe our greatest work has been and is in rearranging the spiritual landscape of Russia, beginning with its youth, from kindergartens through colleges/universities! "...A little child shall lead them." These Color Illustrated Bibles for children, loved also by adults, cost about $4.00. 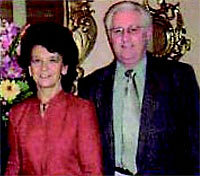 L) League of Prayer - Russia's Director/Attorney, Valentina Petlina. Next to her is Luba, our Certified Teacher and author of Children's books, who ministers to street children at the City Shelter.